9/21/2018 ~ The artwork by Anita Klein, Angel Protecting Acorn, is a powerful reminder that life, even in some of its most iconic forms, like a mighty Oak Tree, is not without a need for protection, especially at that radical stage of the first root. Indeed, the first root is referred to as a “radical” in botany. 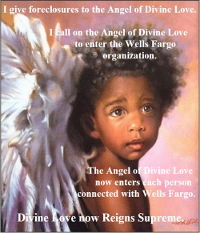 What angel protects acorns, you might scoff. The fact is that we, with our ever active minds, form a Collective Conscious. 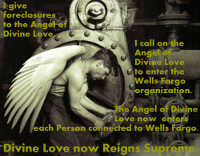 The power of our Collective Conscious is neither stopped by walls nor drowned by waves of misleading news stories. Once we are aware of a truth that awareness takes root in our Conscious. That root, as radical as it may be, is strong even against widespread misinformation and wrongly placed blame. 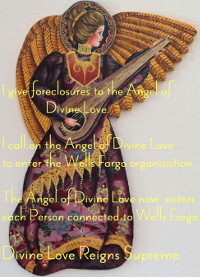 In the case of homeowners foreclosed by banks like Wells Fargo using fraud, the news has blamed homeowners for causing the financial crash of 2008, completely ignoring the role of Walls Street and banks like Wells Fargo. For many homeowners the shame dished out by media has harmed health as certainly as any carcinogen. 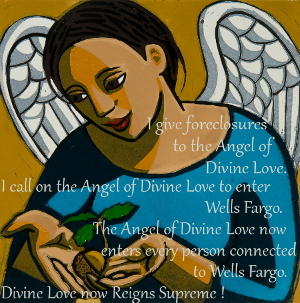 Homeowners who might have had relief from courts that insisted on the law being followed, were sadly disappointed when Wells Fargo and other lenders like it like were allowed to get away with not serving Defendant Homeowners, were allowed to get away with filing false affidavits, with proceeding when in fact they had no standing. People are bombarded with news that tells them which people are bad. Party lines too often define who is bad. These are just two reasons causing the United States to suffer from a division among its citizens. Our Collective Conscious, however, is not fooled. The more truth takes root, the more the division that is hurting us will not be able to withstand the gentle but growing power of the root, which in time is so strong it can break concrete.